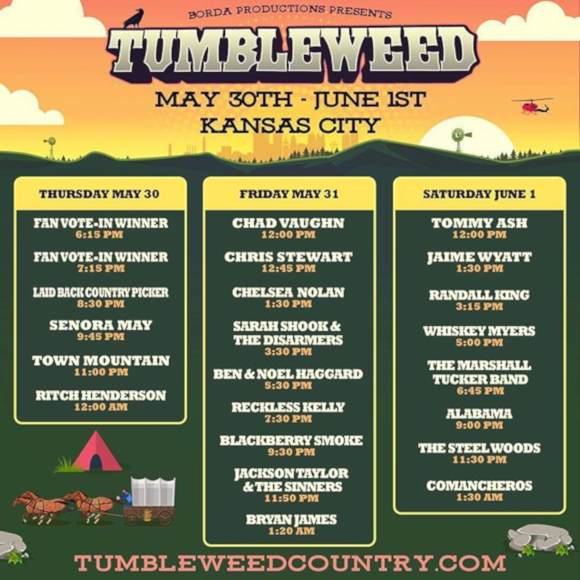 The Tumbleweed Music Festival set to take place just outside of Kansas City May 30th through June 1st has just announced their daily lineups for 2019, and the festival will have a slightly different complexion from previous years by putting all the performers on one main stage. This means that rising stars such as Jaime Wyatt, Randall King, and Saving Country Music’s reigning Album of the Year winners Sarah Shook and The Disarmers won’t have to compete with the headliner talent on a side stage, but will share it with the likes of big time Southern rock bands Whiskey Myers and Blackberry Smoke, and Country Music Hall of Famers Alabama. Bands will also play after the main headliners on the main stage into the night. Single day tickets for those who can’t make it for the entire weekend have just been put on sale for $59, and Noel Haggard has been added to the lineup, playing beside brother Ben representing the Haggard legacy at Tumbleweed 2019. Also two more names have yet to be revealed as part of Tumbleweed’s fan voted slots, with voting concluding on March 27th. 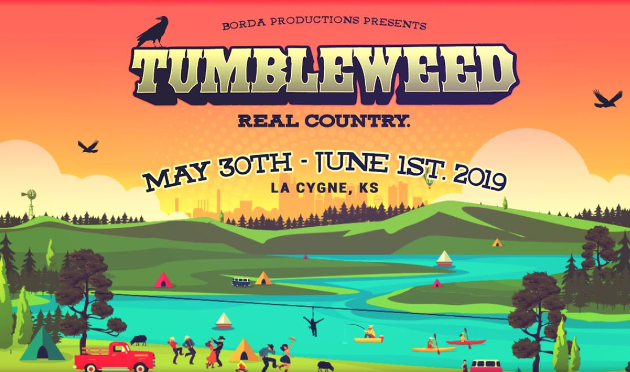 Tumbleweed is produced by Borda Productions, a Kansas City-based music festival company—one of the last major independent production companies in the United States. Along with the music offers other opportunities the 2,600 acre La Cygne (“Lay-Seen”) site, including horse-drawn carriage rides, fishing, canoeing, helicopter rides, hot air balloon rides, zip-line and rock wall, petting zoo, archery, wake boarding & water sports, camp cabins, RV and tent camping. For more information and to purchase tickets, visit tumbleweedcountry.com . Alabama residents get free tickets! I’ll be there! I’m voting Yelawolf in the early slots. If I lived near I’d go one night. Funny how Alabama fell on the bill. I might be reading it wrong and if I am correct me. I’m sure they’re considering the 9:30 Blackberry Smoke slot and the 9p Alabama slot THE headlining slots. The others just come on after. No big deal 9p is prime time. I of course think our album of the year winners should be higher in the bill than 3:30. Yes, the folks playing after the headliners would normally play on a side stage as sort of afterparty bands, or during other main stage sets. But Tumbleweed has decided to put all bands on the main stage, which I think is a really good idea. That way no band has to compete with another band for attention. The headliners are still the headliners. Stop censoring my comments. I’m a person, too. Nobody’s censoring your dumbass comments. Because you keep putting things like the Copyright symbol in your name, they’re getting stuck in the spam filter. I just went and cleaned the filter out, and only found one actual comment from you stuck in there. The rest were comments about you complaining that your comments are getting censored. Sorry, I’ve been drinking again. Cannot wait for this. Just got our tickets. As it happens, our band is in the final group for the fan vote-in slots for the Tumbleweed Festival. The final vote is for ticket holders only. So if any of y’all are ticket holders and interested in voting, there should be an e-mail coming your way to do that. Check us out on all the usual places (Facebook, YouTube, Spotify, etc, etc) and give us a vote, if you’re so inclined.